Ecocoast was contracted to construct all marine facilities related to the Chanel Cruise Collection Fashion Show in Dubai. 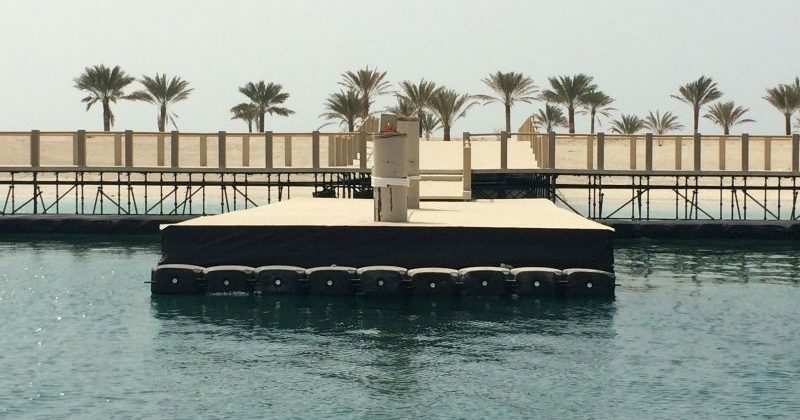 This included design and installation of temporary barge ramps in two locations, marine piling and a temporary marina for Chanel’s “The Island” show on a Private Island off Jumeirah. The location of the event on a desert island meant all facilities and the event venue needed to be constructed from scratch, and no loading or unloading facilities existed. The temporary barge ramps were required to facilitate the construction of structures designed specifically for the one-night event, and a temporary marina was required in order to transport the 1000+ VIP guests to and from the island. These all needed to be constructed at a reasonable cost for a one-night event, but also to a standard expected of a Chanel Fashion Show. Ecocoast’s coastal protection design calculations and expertise meant that the geobag ramp structure provided an ideal temporary solution whilst also ensuring a low environmental impact compared to a more traditional structure, with the barge ramp areas quickly returned to their original condition following the event. Similarly, Ecocoast’s knowledge and capabilities in marine piling and marina installation allowed for the creation of a practical, cost effective and aesthetically pleasing temporary marina that more than met the expectations of our client as well as the attendees of such a high-profile event.